There is no doubt that Texas hold’em poker is one of the most popular card games in the world today. Texas hold’em is also popular in Australia, and there are plenty of competitions being held in different parts of the country, including the Riverina. As a matter of fact, in the towns that surround Tocumwal, there are poker competitions every night of the week. 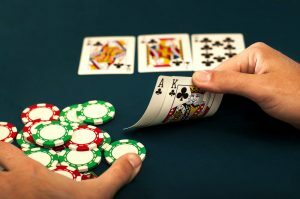 As keen poker players ourselves, we thought we’d explore the humble beginnings of Texas hold’em and let you know what tournaments are on and when. Often called the “thinking man’s game,” you might have already guessed that the game originated in Texas, specifically in Robstown. It remained in Texas up until it was introduced to Las Vegas, the gambling capital of the world, by Crandell Addington and his associates in 1967. Nobody knows for sure exactly how the game was invented, but everyone can agree that it is indeed a thinking man’s game because it requires players to think and play strategically in order to win. During its first few years in Vegas, Texas hold’em could only be played at one casino – The Golden Nugget. Unlike the dazzling casino it is today, The Golden Nugget was actually a seedy joint, for the lack of better term, and not many high-stake players frequented the place. Because of this, Texas hold’em remained unpopular for the next two years. It all changed in 1969 when a Texas hold’em tournament was held at The Dune casino. Because of the popularity and prominence of the venue, the tournament was a success, rewarding high rollers with lots of prizes. As a result, the game became significantly popular not only in Las Vegas but in other parts of the world. Read more about the history of Texas Hold’em here. You can also keep up to date on the Barooga Poker Facebook page. See you there!